My saucer in today's post has a paper label "Thames, made in Japan, hand painted". 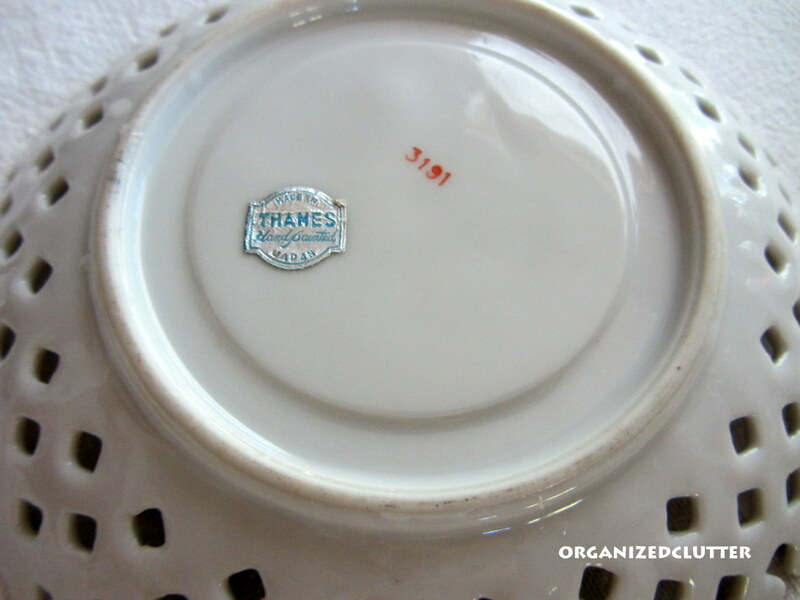 There is also a number painted on the bottom of the tea cup and saucer "3191". Most of the tea cups in my collection were made in England and are bone china, but I have a few that were made in Japan. This lustreware tea cup has a very unusual shaped handle and three feet. The saucer has a lattice pattern. 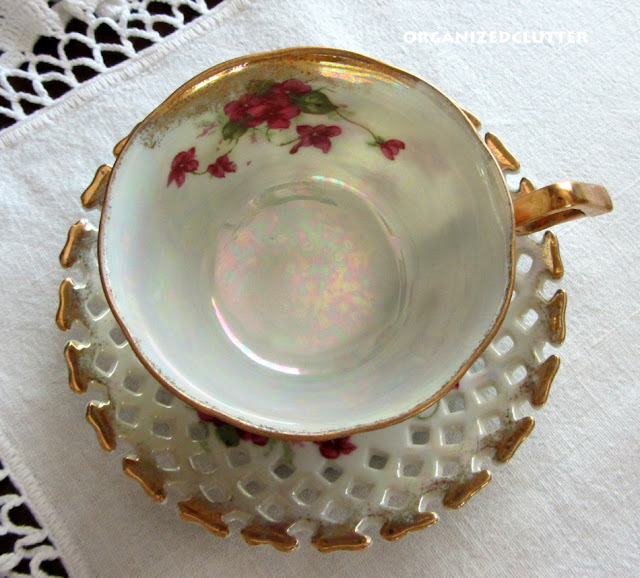 Both cup and saucer are trimmed in a daubed-on look gold. The flowers are a rosy burgundy. 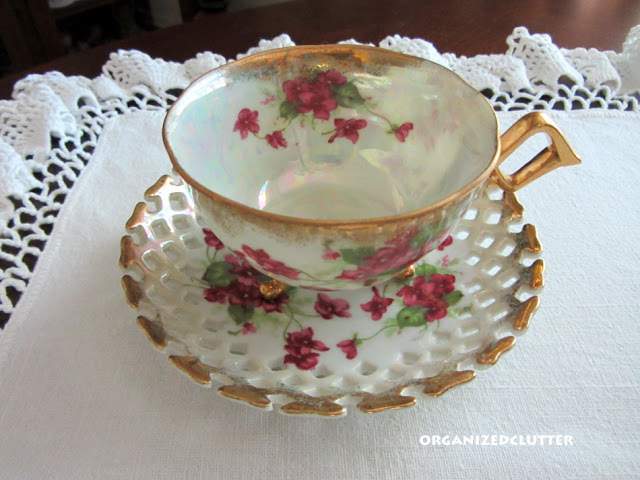 Do you collect made in Japan tea cups and saucers? I saw a comment from you on Debbie Doos blog. Did you understand what to do to link to the newbie thing? what does the sidebar thing look like? PS cool that you have an Ancestry.com ad. I love that site and I am addicted to family history. Carlene, you really have some beautiful cups and saucers. This one is a really pretty. I pick up some now and then if I like the design. I don't really notice where they are from. Better start paying attention. Carlene,I love the teacup and the saucer is beyond words, so lovely. Beautiful! That saucer is really lovely. Hi Carlene. That's a beauty! I love 3 footed teacups and they are very collectible! That's such a pretty pattern! Thanks so much for sharing your gorgeous photos of the pretty teacup and linking to Tuesday Cuppa Tea! I love teacups and this one is not only beautiful but unique too! wow, love it! The footed teacup is so dainty and the saucer with the lattice work is a work of art! I have one that is almost the same pattern. The saucer isnot as detailed... Very pretty! What a stunning tea cup and saucer!! Love the lattice pattern of the saucer!! Very unique and quite pretty!! Hi there! I was on another blog and saw your blog so I decided to stop by. Thank you for sharing and I will enjoy following your blog. Carlene, that teacup is simply beautiful with the dainty little legs! Beautiful tea cup with it's little feet, and the saucer is so unusual. I collected tea cups many years ago, but have no idea what I did with them. Carlene, your three footed teacup is so very pretty and a real collectable! 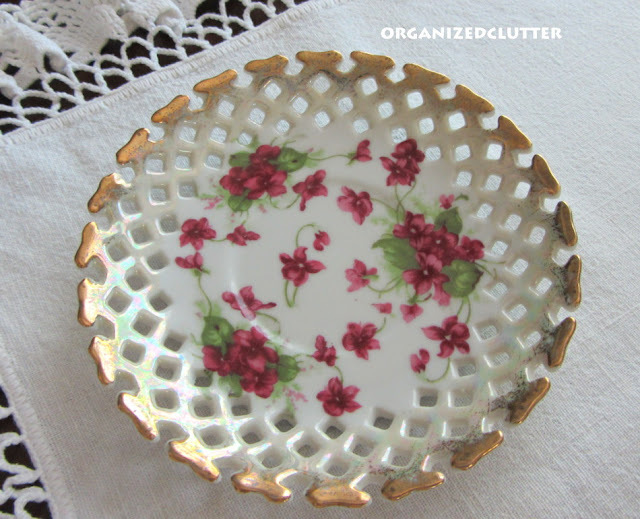 Love the luster, the pretty flowers, and lattice work! Thank you for sharing your pretty with us and have a lovely week. 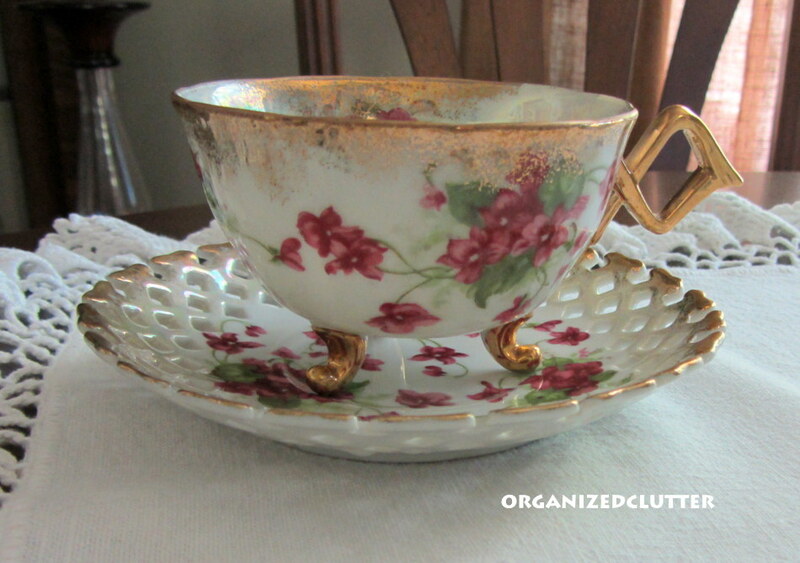 The tacup with feet is gorgeous, along with that gorgeous too, reticulated saucer!! Japanese porcelains are just soooooo lovely!! I am loving your Japanese lusterware tea cup! It has just the perfect Japanese style flowers, so pretty in vibrant pink! The cut work plate and the unique handle really make your cup superbly vintage. I adore lusterware, and have a couple Japanese tea cups around here. Beautiful Carlene. I don't collect it, but I can so admire yours. It is so much fun to see your lovely cup and saucer! The lattice pierced saucer is just gorgeous. The detail is wonderful and seems to be hand painted. I love your title Organized Clutter so cute with the darling photos. My mother had a set of this type of tea cups. We lived in Japan in the 60's. I think she and her friends had china parties. The idea was not to have all the same pattern. I have no idea what happened to the china.